We spent the day up on the North Shore of Oahu. It was rainy and the car ride put Kayla right to sleep. Good rest day for her. 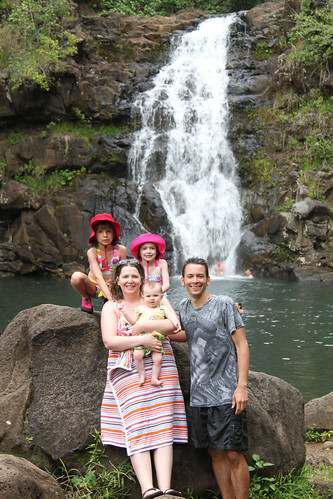 Later, we hiked into Waimea Valley for a swim and a foliage tour. Here is a group shot of Kayla’s crew! 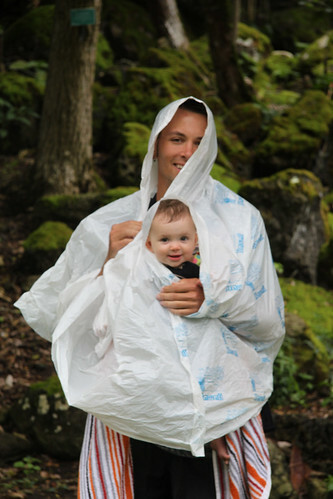 I kept the baby dry by wrapping her in plastic with me. No suffocation occurred as I had her head in the arm hole. Not much else to report this day. Maybe a little tidbit that Kayla really likes “people food” at meals. She wants to get her hands on some bread, crackers, Cheerios, or whatever she can find. She really wants to feed herself now during this trip. That good. Start pooping in a toilet next and we will really be getting somewhere kid!